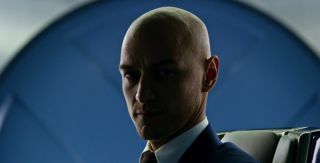 Over the past two X-Men films James McAvoy's Charles Xavier has gradually been taking the steps towards becoming Professor X. The transformation will be complete in X-Men: Apocalypse, which will see McAvoy finally shave his locks to portray the iconic mutant. Onetime Professor X Patrick Stewart watched the momentous occasion as it unfolded, and now we can too. The video makes for a fun watch; while McAvoy jokes that he's getting a better understanding of what it means to be Stewart, the elder actor notes that he was already bald when he was 19! One of my favourite moments in X-Men: Days of Future Past is the meeting between past and present Xavier; Stewart and McAvoy have been great custodians of this iconic character, and it's made especially clear in that scene. Apocalypse probably won't be the last time we see McAvoy's Xavier on screens, so he'll have to get used to plenty of hairless days in the not so distant future.